I often meet a customer user who's not aware of the new To-do list view called Date View. Once the user learns about it, they are very pleased. The value of this view is to group your to-do project steps and personal tasks in a much more consumable view. This is much better than the default list view. In your PIEmatrix account, go to your To-do tab. Click on the View button in the upper right corner of the page. This brings up the View Options window. Under Sort is a Group option. Change it from the none select choice to the Date Group option. Your list will now be grouped by date. Another option is to group your to-dos by Project Group. Personally, I usually work in the Date Group view since each step has its project link. 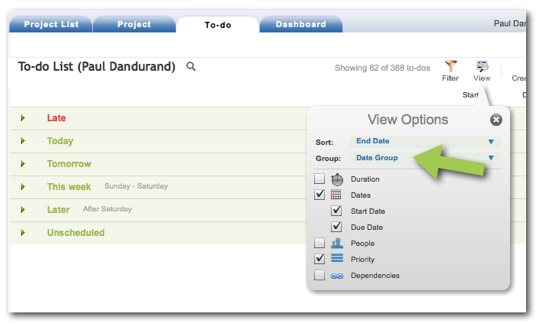 Try it out and find your to-do list will be much more manageable than the default list view. Soon, we will change the application so it will default to the date group view for new users.